The British pound was the big mover of the day again benefiting as risk tolerance returns to more normal levels. The VIX index dropped another five points today taking the level back to the mid 25-area. The index peaked over forty last week as fears over China unsettled investors around the globe. The long term average on the VIX is around 12-13 and any readings above are often seen when markets become more averse to risk. Chinese equities have stabilized somewhat this week. This has led some to believe the painful correction that’s wiped forty percent off the value of the main share index has run its course. The Shanghai Composite rose by nearly three percent today adding to last week’s modest gains. China’s trade balance grew far more than expected in August. The balance of trade stood at $60.24B, more than $12B higher than expected. The increase was due to a much bigger fall in imports than had been predicted while exports remained steady. 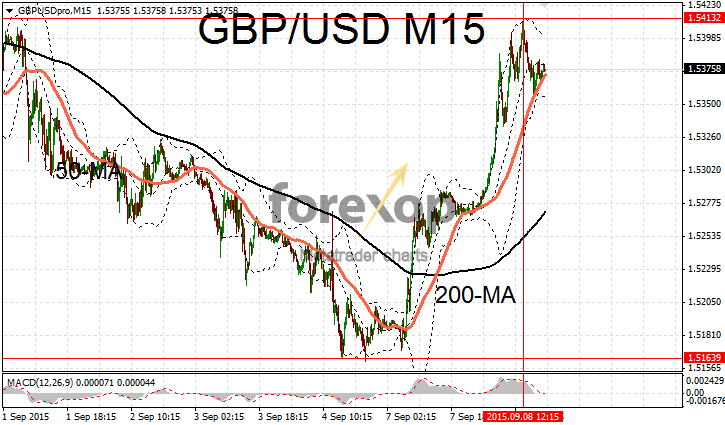 GBP/USD extended yesterday’s rally carrying the pair briefly back above the 1.54 level. 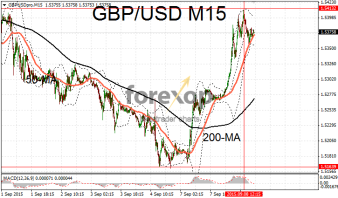 “Cable” eased back to 1.5375 however in late trade as profit taking set in. The pair remains heavily overbought at the lower time frames, though some scope for further upside exists on the daily chart. The MACD began to indicate a sell signal after the strong rally and selling duly set in sending the market lower. Sterling has suffered a brutal correction following the turmoil amid the Chinese equity crisis. Today’s moves are occurring as the market levels out and some of those risk positions are pulled back. As such sterling’s snap back against the yen was even more extreme. GBP/JPY has jumped by two percent since Friday taking the level back up to 184.3. Yen “bulls” were disappointed after a poor reading from the eco watchers survey. The closely watched index fell unexpectedly to 49.3 in August. The level marks a seven month low and raised concerns about the strength of the Japanese recovery. Crude oil prices tracked higher, broadly following the improvement in sentiment surrounding China. Brent was trading just below the $50 per barrel mark after rising nearly two dollars.